Southern Illinois University Edwardsville’s campus was full of vibrant smiles and informational exchange on Monday, Aug. 20 as the fall 2018 semester got underway. The Office of the Vice Chancellor for Student Affairs, as well as faculty and staff from across campus served lemonade and offered words of encouragement to students passing to and from classes. 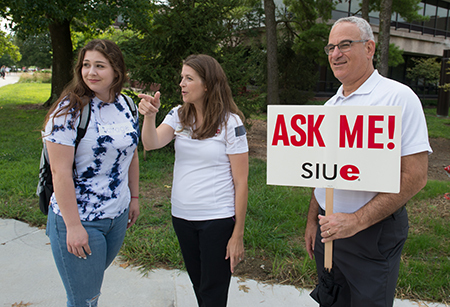 Volunteers holding “Ask Me!” signs shared their campus knowledge and supplied students with helpful advice as they navigated their first day schedule. Inside the Morris University Center (MUC), more enthusiasm and engagement could be found. Students stopped by the Goshen Lounge for a fun caricature with friends. They also mingled with campus representatives about the many resources available on campus, from the Career Development Center, Study Abroad and ROTC to the Kimmel Student Involvement Center and more. 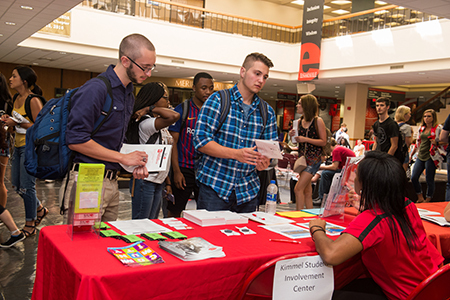 SIUE’s Resource Fair will continue from 10 a.m.-2 p.m. Tuesday, Aug. 21 in the MUC. The Campus Activities Board will sponsor a Merchant’s Fair from 10 a.m.-2 p.m. in the MUC on Wednesday, Aug. 22. A list of upcoming events can be found at siue.edu/cab/cougarwelcome. Photos: Cole Wendler, of Troy, happily accepts a cup of lemonade as he walks to class. University Housing Director Michael Schultz (right) and Associate Director Mallory Sidarous (middle) offer direction to Heather Winter, of Belleville, on the first day of classes. 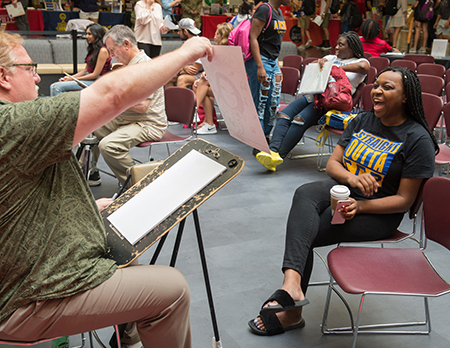 Capri Wroten, of Chicago, reacts happily to her newly created caricature during the SIUE Resource Fair. Nathan Cauley (left), of Bunker Hill, and Logan Siekmann, of Troy, visit with a representative from the Kimmel Student Involvement Center during the SIUE Resource Fair.